If pastels were popular in the Rococo—light lemon chiffons, shell pinks, and wide sky blues that matched the levity and frivolity of the age, what does the love of muddied colours say of our time? We’re all in the ____? This season I’m growing creme brûlée and cherry caramel Phlox, both deliciously muted. My Digitalis ferruginea (aka rusty foxglove) has re-seeded itself much to my delight. Cafe au Lait, a creamy beige dinnerplate dahlia, has been the number one wedding flower for a few years. Antike carnations and Belle époque tulips are also the rage, combining gold and pink into a smouldering buff. 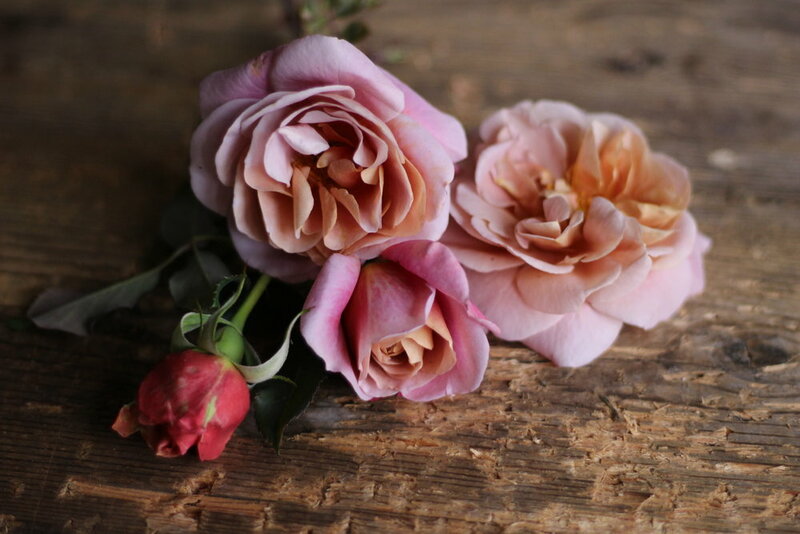 The ‘Koko Loco’ rose similarly demands painterly adjectives because it isn’t truly a colour at all: it’s lavender, pinkish, and butterscotch-ish. What happened to pure colour? Have we all been tinted and toned? When was the last time I actually indulged in a caramel, creme brûlée or butterscotch other than in my garden? Eons ago: I’ve pretty much given up dairy. Yet my garden is a horticultural ice cream parlour this year. I’m growing ‘Hot Chocolate’ Nicotiana and Chocolate Cosmos (C. atrosanguineus) and ‘Seaton’s Toffee’ chrysanthemums. I’m on the hunt for ‘Brownie’ and ‘Burnt Sugar’ tulips, Heuchera ‘Caramel’ and ‘Tiramisu’ despite already owning ‘Ginger Ale’, ‘Mai Tai’ and ‘Marmalade’. If I’d been better organized last year, I’d be looking forward to rich brown bearded irises burnished with apricot, which are having a renaissance given their sombre hues. In this age of healthful abstention, do we now drink our greens and only indulge in visual desserts? Last year I visited Sarah Raven at her garden at Perch Hill in England. She’s famous for her book The Cutting Garden (1996), which is as resplendent and colourful as they come (‘Venetian is how she describes her past palette of choice). The Cutting Garden’s style brings to mind the other gardening books of that age: The Jewel Garden: A Story of Despair and Redemption by Monty and Sarah Don and Thomas Hobbs The Jewel Box Garden, both from 2004. Euphorbias glowed in these books, and garden rooms glittered with luminous maroons, poignant purples, striking raspberries and brilliant orange. Raven even had periwinkle blue posts erected in her garden for one more hit of colour. This generation of gardeners, only a few years off from my own I admit, shoulder-padded their way onto a brightly lit stage. And now? We’ve entered the age of nuance. Perhaps we can blame Oudolf and the new naturalism: those wafting waves of smoky seedheads, the undulating desiccated grasses, and the romance of backlighting. Or more practically, the advent of camera phones which hate red. In any case, it feels as if plants have ripened to a toasty crisp, frosted up, and faded out. And now we need a new (or archaic) colour dictionary to describe them. At Perch Hill I heard the young trend-setting Anna Potter of Swallows & Damsons say, ‘anything that isn’t a colour, is my colour’. I hope I’m not being too facile, but if we need so many descriptors in these days of identity politics, wouldn’t it make sense that we’d also seek gradations in our gardens? If that’s true, I just hope we can do more than just desserts.